Atlanta tennis fans scored an incredible opportunity Friday on Ladies Day with a VIP tennis clinic on Court 3 where Patrick McEnroe, top TV tennis commentator and former No. 28 player in the world, made an appearance and participated in doubles drills. Nearly 20 participated in an hour-long clinic, met McEnroe, and later enjoyed brunch at STRIP where they received tournament gift bags, Spa Sydell exclusive offers and services, and upgraded tickets to City View Suites for Friday’s matches. “This is actually the beginning of my experience at the BB&T Atlanta Open and to have McEnroe on court was not a bad way to start my day here,” she said.Atlanta tennis fans, like Dena Pickard, participated in Ladies Day and had big expectations for their time at Atlantic Station. The ladies took every opportunity to meet and play doubles with McEnroe during their clinic time. Wells Snyder, a local pro, held the clinic for the ladies and was thrilled when McEnroe actually came on-court to participate in the drills. McEnroe described his time at the Ladies Day clinic with enthusiasm as he was thrilled to see a great turnout. Dr. Herb Kollinger, cosmetic surgeon, and Dawn Bryant, Director of Marketing and Sales for Spa Sydell, enjoyed educating the ladies about their products while offering mini massages upstairs at STRIP after the clinic. “I’m a tennis player and come to the BB&T Atlanta Open each year, but I really enjoy working with the ladies to educate them about our services,” Dr. Kollinger said. The day’s highlights did not end until after the sun began to set over the stadium court. A BB&T ball-toss competition took place where fans could participate for a chance to win a $200 BB&T Visa gift card. Fans received rubber, stress tennis balls and wrote their name and phone number on them as they entered the main tournament entrance for the evening session. As the entire ball person staff gathered on court and placed four large, plastic buckets in each corner of the court after the 7 p.m. match concluded, the crowd began to stand and take aim towards the targets. 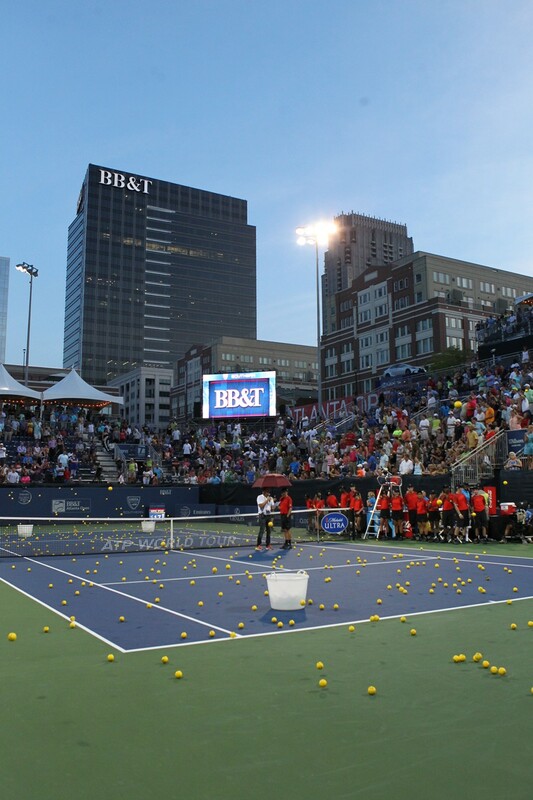 Hundreds of balls bounced several feet in the air and covered stadium court while dozens landed inside the buckets. Emily Brown, who works in the Sports Marketing department for BB&T, drew a random ball from a bucket on the ad side of the court to the right of the umpire’s chair. Robert Gaskin and the rest of the crowd believed he actually won a “2014 Ford Mustang Convertible,” until the announcer finished the sentence with the key word, “keychain.” Laughter emerged before the announcement of the grand prize. Instead, Brown presented Gaskin with a $200 BB&T Visa gift card once he ran out of his seat, around the stands, and onto the court.